I’ve always been interested in Greek mythology, so when I heard that the Old Vic was staging a production of ‘Electra’, I was excited and managed to book tickets to go along on the opening night. 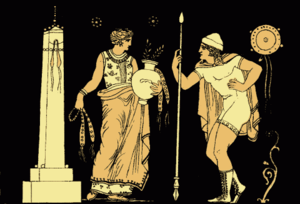 Before watching the production, I knew the basic premise of the story – Electra seeks revenge on her cheating mother, Clytemnestra, and stepfather, Aegisthus, who murdered her father – but weirdly I knew more about Jung’s Electra complex so I was eager to learn more about this play which has spawned such an interesting psychoanalytical theory. The image of Kristin Scott Thomas’s elongated, deathly pale face that is around everywhere to advertise the production made me think I’d be in for a dark, intense and haunting experience – an uncomfortable watch, one of those that lingers in your mind long after you’ve watched it. Unfortunately it wasn’t really any of these things. The subject matter – murder, infidelity and repressed sexuality – is obviously dark but this intensity was never really captured by the production. Perhaps this was because the script swayed from tragedy to comedy, never fully managing either successfully. Indeed, basic points of the plot such as Orestes pretending to be dead as part of a plot to avenge the death of his father seemed redundant and futile in the production, especially given that Orestes seemed to murder Clytemnestra and Aegisthus with very little difficulty. I ended up wondering why Electra had waited all these years for Orestes to murder her mother and stepfather, when it seemed ridiculously easy to do. The production subsequently lacked any kind of tension or suspense, and the apparent futility of Orestes’ deception resulted in an anti-climactic ending that left me feeling rather cheated. This is not to say that I didn’t entirely enjoy the play. The brevity of it (there was no interval) meant that you never felt as though it was dragging on, which would have been quite easy for such a production, and the acting was technically fine. On the face of it, Kristin Scott Thomas is an adept Electra – wailing, sad and full of resentment towards her mother and her lover. Her deep, almost baritone voice, lent a touch of poignancy and regret to some of her lamentings. (Others just made me think of a toddler throwing a strop on the floor). What her performance, and the Frank McGuinness’s version of the play in general (it is by no means the fault of one individual’s performance), lacked was any deeper emotional content to draw the audience in, to make them connect, empathise and feel that King Agammemnon was someone who had suffered a betrayal so bad that avenging his death was the possible action. And even Kristen Scott Thomas, with her frantic hand-wringing and writhing around on the floor in a dishevelled dress, couldn’t accomplish that.